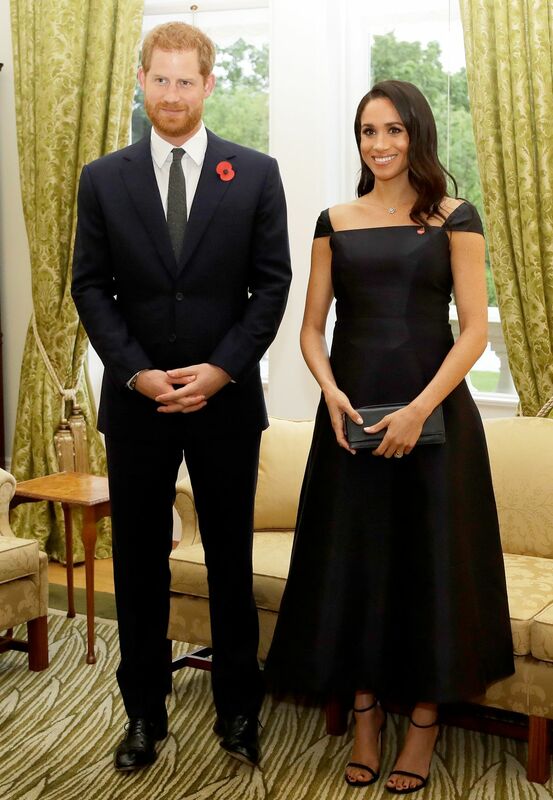 The Duchess of Sussex is not just sticking to a formal royal uniform for her first official tour of Australia, Fiji, Tonga and New Zealand. She has worn a pair of skinny jeans, Veja trainers, Reformation sundress and & Other Stories polka dot dress. But one royal styling convention she is firmly sticking to is nodding to her host country via her outfits. It is customary for the royal family to wear designers from the nations they visit, colors and motifs to reflect the stops on their schedule and brands with an ethos that align with their own messages. Case in point? 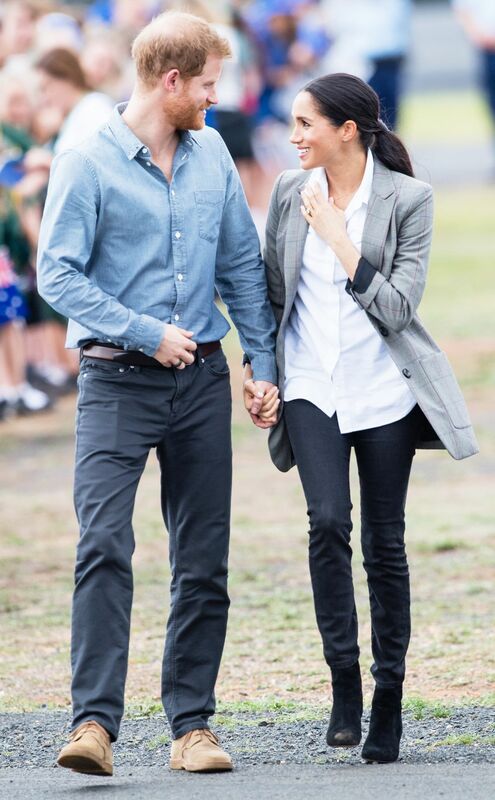 Markle has been wearing a pair of skinny jeans by sustainable denim brand Outland, a company created by an Australian couple who manufacture in Cambodia and provide support and a career path for women who have survived human trafficking. “I cannot think of a more suitable person to carry the Outland Denim brand. The duchess’ advocacy for issues of social justice and women’s rights completely aligns with the work that we do. We are absolutely thrilled that she chose to wear Outland Denim on this tour,” says James Bartle, Founder of Outland Denim. Aware that these pictures will go all over the world in mere minutes, the Duchess is cleverly using the “Meghan Effect” to grow the companies that will have a positive impact. She has worn brands with a sustainable stand point, such as Veja and Reformation. We’ll be bringing you all of Meghan Markle’s outfits from the 76 engagements scheduled on this 16-day royal tour. Keep scrolling to see the first looks of many. 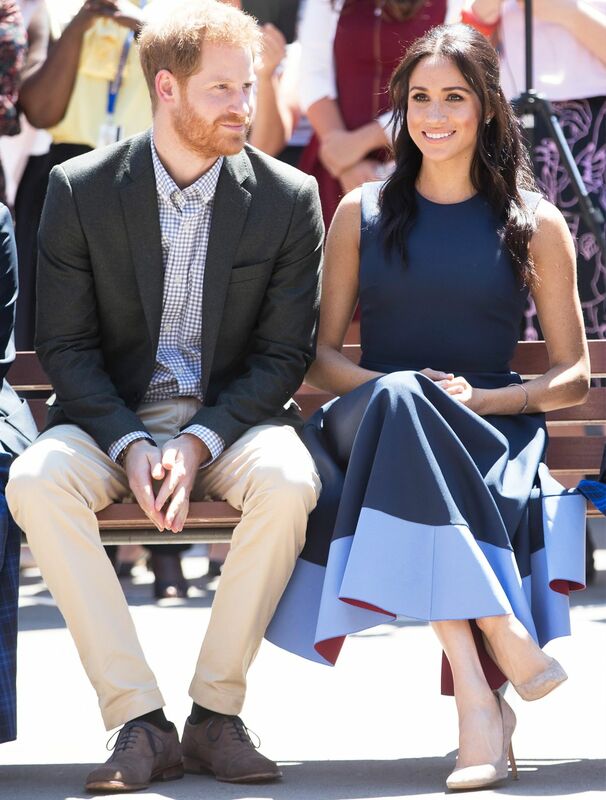 Style Notes: To visit Rainbow Springs to learn more about the center’s kiwi breeding program, Meghan reverted back to her wedding dress designer with a navy blue, pleated Givenchy midi dress. 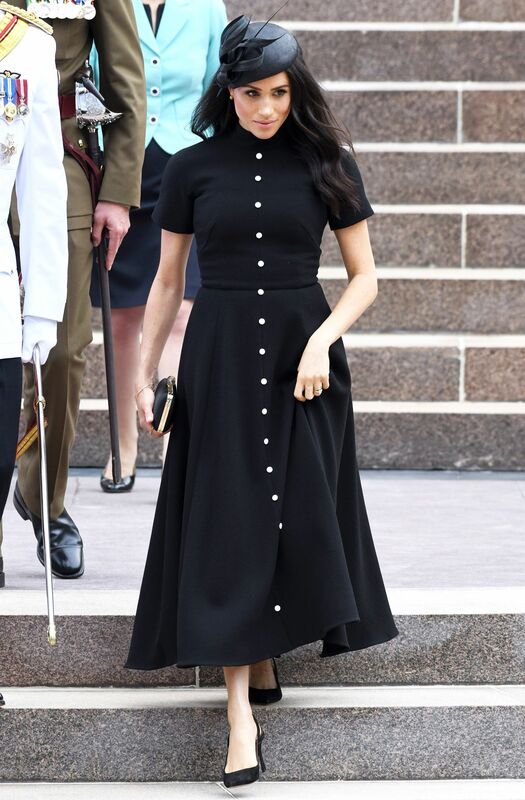 Style Notes: To meet with New Zealand’s Prime Minister, Markle wore a black Gabriela Hearst dress with a very Audrey Hepburn silhouette and elegant capped sleeves. 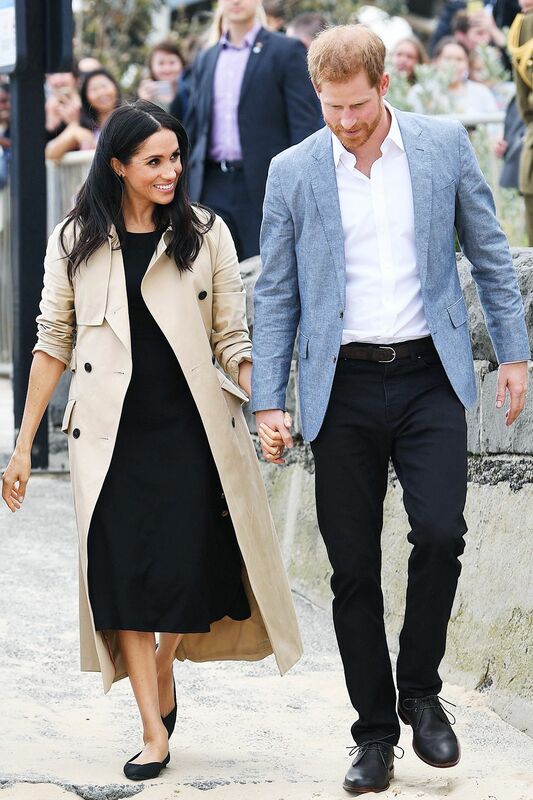 Style Notes: Meghan arrived in New Zealand wearing a Karen Walker checked trench coat. 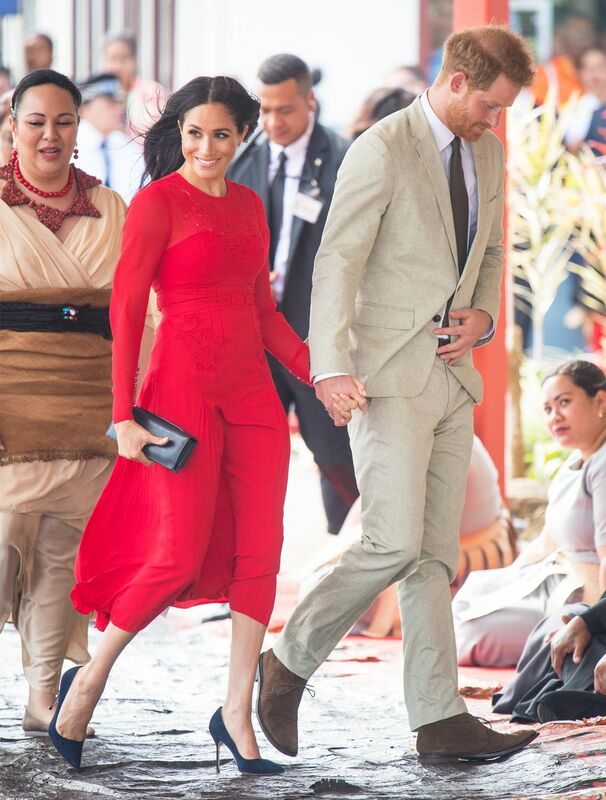 Style Notes: For their final engagement in Tonga, Meghan and Harry attended the unveiling of The Queen’s Commonwealth Canopy at Tupou College. 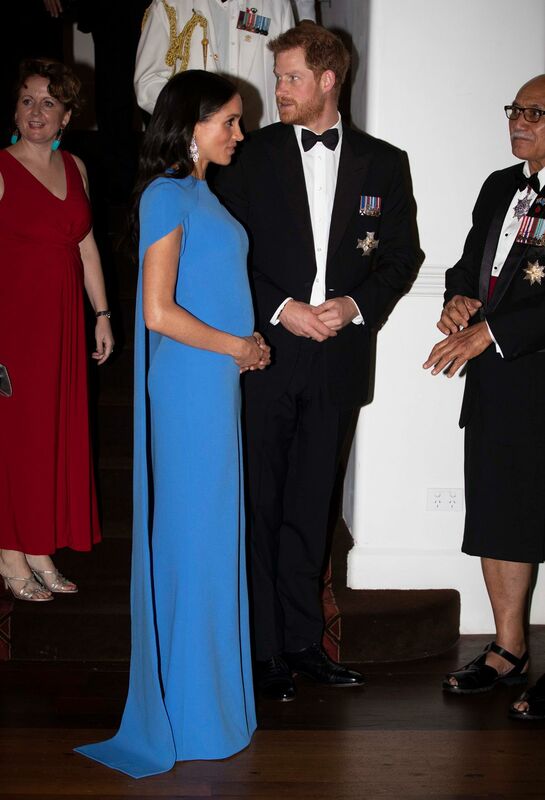 Meghan wore a dress by Veronica Beard, which is a remarkably similar color to her Safyiaa ball gown (maybe a new fave for the duchess?). 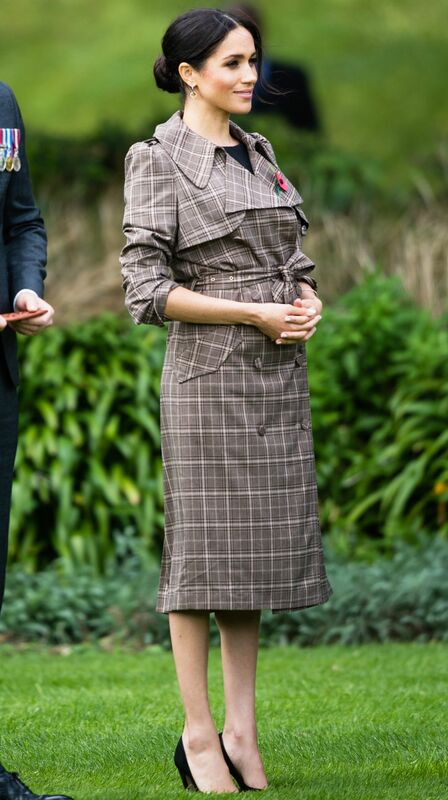 Style Notes: To meet Tonga’s Prime Minister, Meghan wore a khaki and white stripe Martin Grant shirt dress, which she paired with Prada’s Bibliotheque Bag. With its nipped in waist and calf-skimming length, this outfit is quintessential Meghan. Style Notes: For her second day in Fiji and a visit to the University of the South Pacific, Meghan Markle wore a pink printed silk dress by Figue, which is available for $1495. She paired it with a pair of black Castañer wedges and a clutch she bought at the Suva Market. Style Notes: Markle arrived at Fraser Island in a red polka-dot midi dress by & Other Stories. 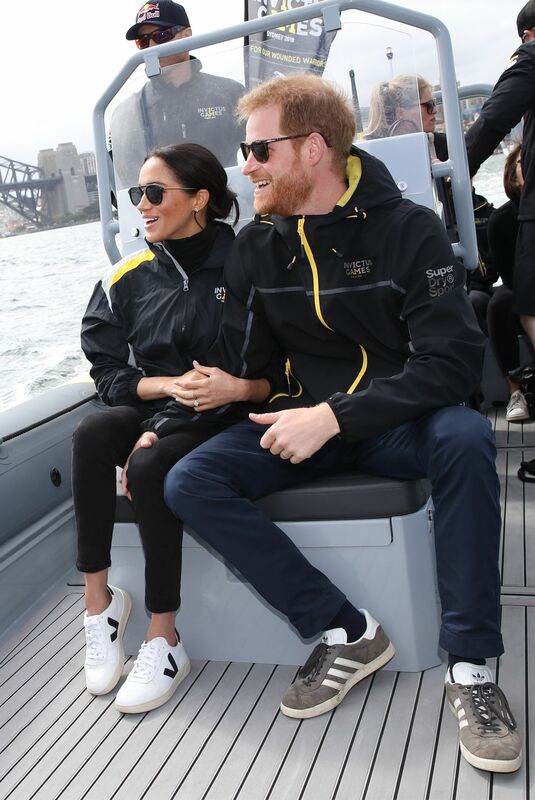 Style Notes: For a boat trip in Sydney, the duchess wore a pair of skinny black jeans and trainers by the French sustainable brand Veja. Style Notes: On day six of the tour, Meghan wore a blazer and skinny jeans again—this time wearing a cream pinstripe jacket by L’Agence with a roll-neck by Wolford. 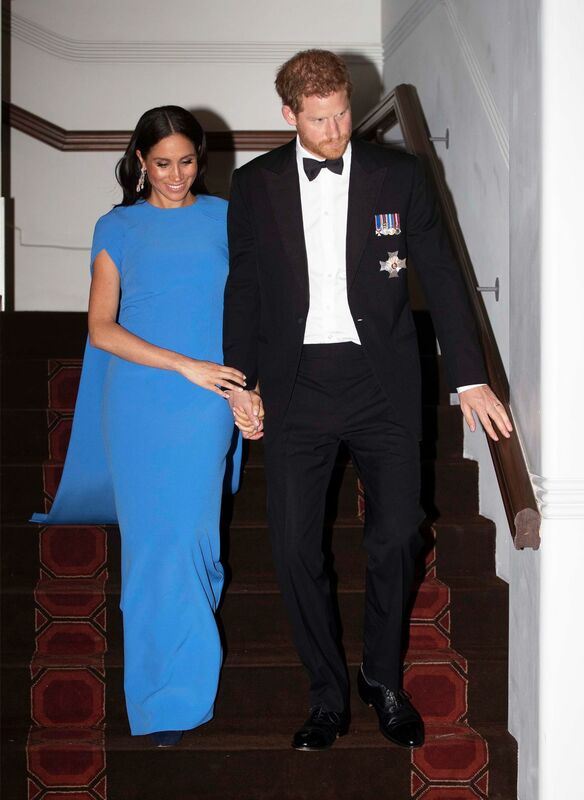 Style Notes: Meghan Markle wore a British designer for the first time on her tour in Australia, wearing a navy sleeveless dress with a powder blue hem by London Fashion Week designer Roksanda. 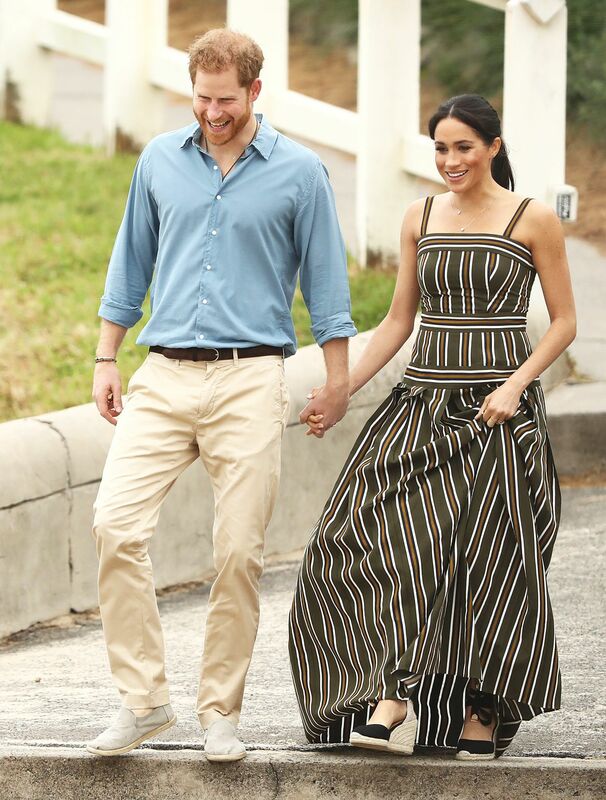 Style Notes: The couple met with a surfing group in Bondi Beach, and Markle wore a striped maxi dress by Australian resort label Martin Grant. The dress is from the brand’s upcoming spring/summer 2019 collection. The duchess paired her dress with black Castañer wedge espadrilles. 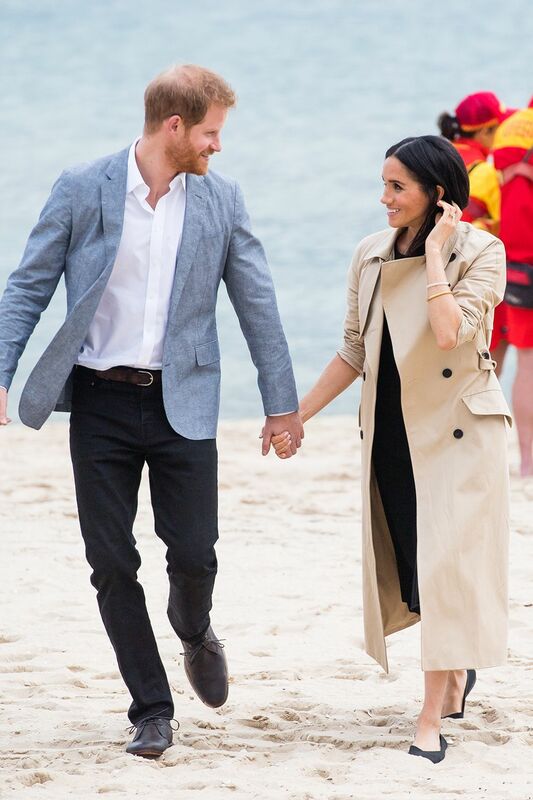 Style Notes: For day three of the royal tour, the couple headed down to a beach in Melbourne to learn about sustainability and waste. 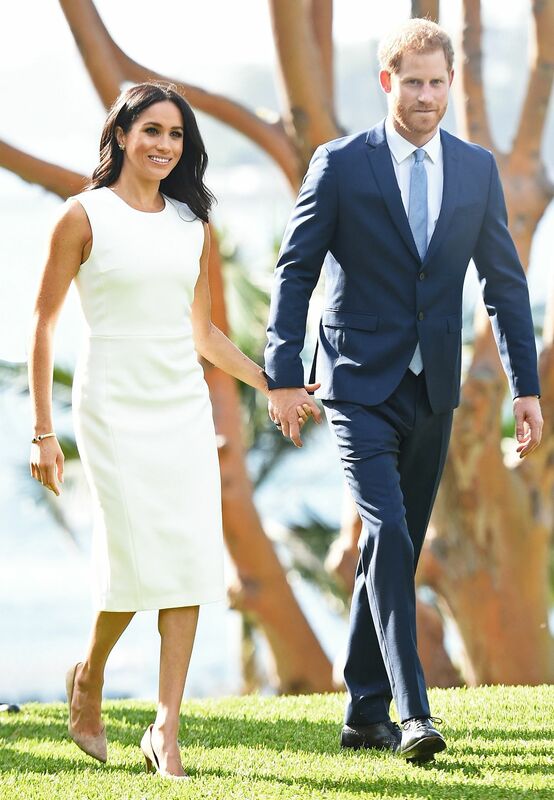 For the trip, Markle swapped out her navy dress and court shoes (gotta love a cheeky outfit change) for a slightly more beach-friendly outfit, which included a black dress by Club Monaco, a trench by Martin Grant and black flats by Rothy’s. Very Audrey Hepburn. 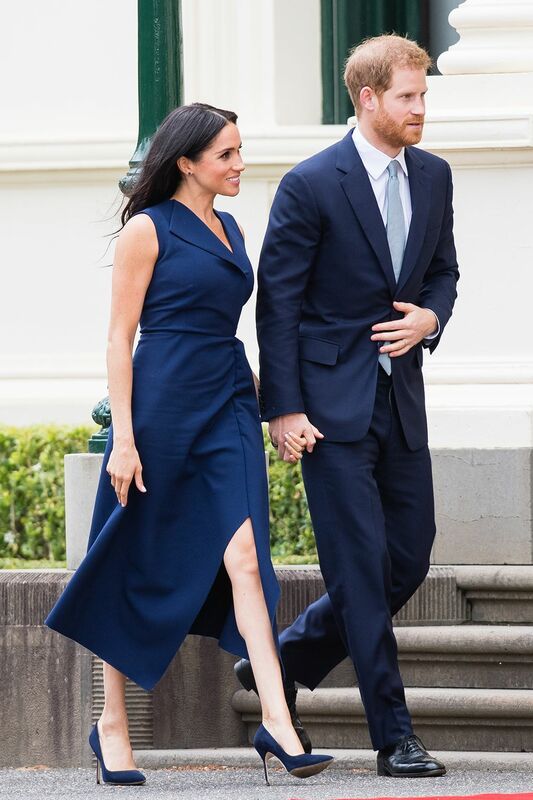 Style Notes: Earlier in the day, Meghan opted for a classic tailored dress by Dion Lee to greet fans at Melbourne’s Royal Botanic Gardens before heading to a reception with local government. 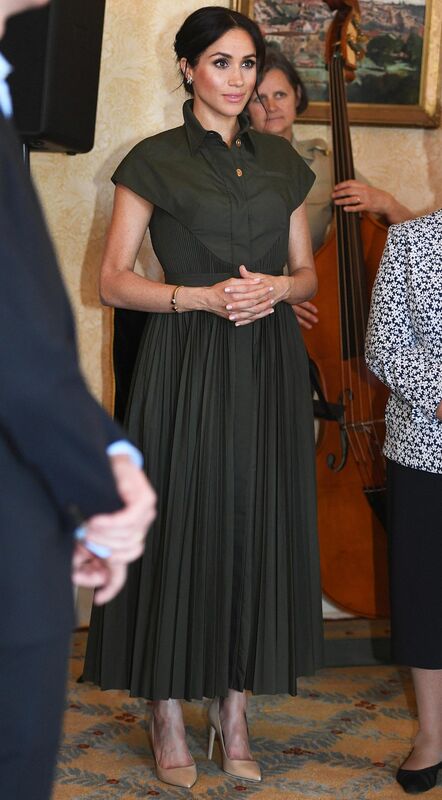 The Duchess paired the asymmetric number with her signature Manolo Blahnik pumps and minimal accessories. 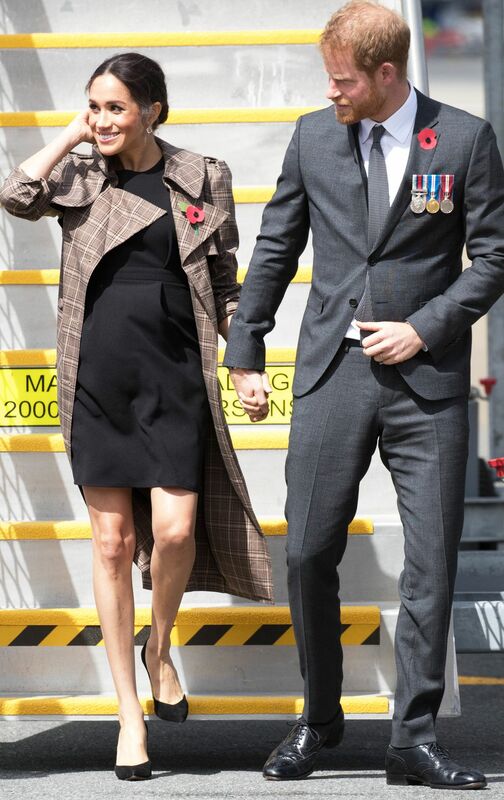 Style Notes: For the second day of the royal tour, the couple visited Dubbo, New South Wales—an area that has been affected by a severe drought. Meghan opted for a more casual look, wearing a classic white shirt by Maison Kitsuné, a pair of dark wash skinny jeans by Outlander, black suede J.Crew ankle boots and a now sold-out grey check blazer from her close friend Serena Williams’ clothing line. 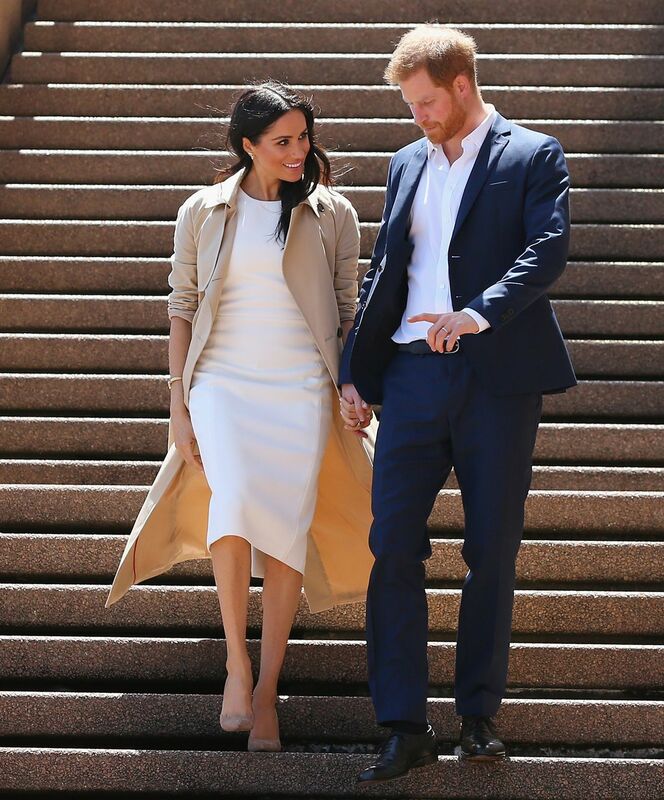 Style Notes: For an evening reception in Sydney on the first day of her royal tour, Markle wore a khaki shirtdress by American designer Brandon Maxwell with Princess Diana’s jewelry. 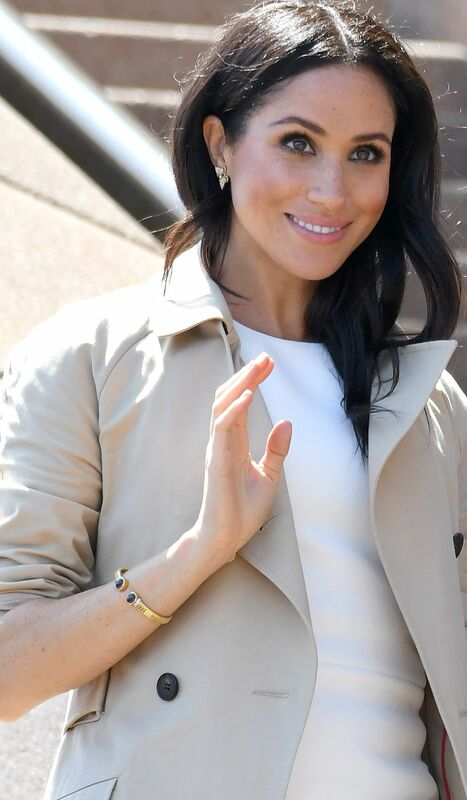 Style Notes: For her first official royal tour look since becoming a duchess, Meghan Markle turned to Australian designer Karen Gee, and wore a white sleeveless fitted dress with neutral suede pumps, a trench coat and jewelry from Princess Diana’s collection (a bangle and a pair of butterfly stud earrings). Busy Philipps & Jenny Slate Celebrate the LA Opening of Creatures of Comfort!